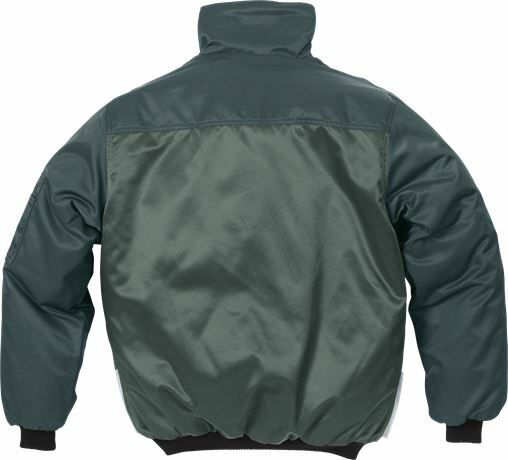 Warm and durable jacket in dirt-, oil- and waterrepellent material with pile lining and reflective detailing in side seams. Material: 100% polyester. Wadding 100% polyester. Lining in 100% polyester. Polydex, dirt, oil and water-repellent / Two-colour / Contrast stitching / Pile lining / Quilted silky lining in sleeves / Ribbed cuffs and waist / Pile lining in collar / Reflective detailing in side seams / 2 chest pockets with internal pocket and flap / Mobile phone pocket with zip and storm flap / Sleeve pocket with zip / Diagonal cut front with side pockets integrated into seams / Inside pocket / Approved according to EN 342.